Caution: Electric Matches, especially commercial electric matches, are sensitive - much more sensitive than most people realize. Handle them with care. You can ignite a commercial electric match by just scuffing it with your shoe or hitting it on a table. 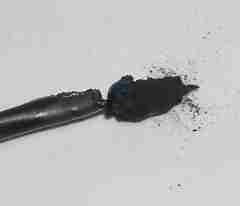 Never yank an electric match out of a mortar or a device. The Pyrogen, the flammable stuff on the end of the electric match, is very sensitive. Good Practice Hint: Always tie off your electric match leads. Usually that means taping them down if working with 1.4g items - especially mortars. If you don't, they will take off with the item and mess up other wiring hookups or your connection boxes. Above is a commercial electric match. The blue shroud slides over the pyrogen and concentrates the fire into the material. Most people leave them covered when firing. Commercial electric matches (aka squibs, Davey Fires, etc) are both expensive and require a license to purchase. The small electric matches used to fire Estes rockets are somewhat unreliable, fragile and also expensive. If you are an unlicensed hobbyist and want to fire a simple backyard Class C (1.4g) display, you are stuck with hand firing unless you make the matches yourself. The following information shows how to make electric matches using common materials. Before we get to the homemade stuff, there is an alternative for making electric matches that are almost like commercial ones. You can purchase the chips that are attached to the ends of the wires - they don't have pyrogen on them - and solder your own e-matches. You then dip them in your own pyrogen. For these versions, a hotter pyrogen is needed and most retailers will give you a formula for it when you buy the product. The chemicals needed typically include antimony trisulfide and potassium chlorate so if you do not like working with those two chemicals - which when combined are very sensitive - then skip this section. However, you don't need to make a lot of the mix and you can keep it wet with acetone to prevent sensitivity. Sometimes you can buy a pyrogen kit which will make 10 grams or so of pyrogen - enough for a hundred or more matches - and that makes it easier.. The chips are small so you have to make a jig to hold them - wooden clothespins attached to a board are the easiest clamps to make - sand down the noses of the clothespins so they can just nip the end of the chip. At the time of this writing, Skylighter had small quantities of these - ODA enterprises does bigger lots. 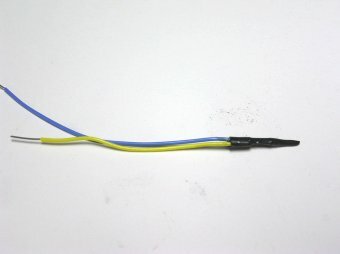 Use 22 or 24 gauge solid core wire - scab wire salvaged from a show or telephone hookup wire - to connect to the chips. You can get telephone hookup wire from Menards or other large home supplier fairly cheaply. For pyrogens, that flammable stuff on the end of the match, you can make exotic stuff or simple stuff. Since some of the exotic mixes are quite energetic we won't go into using them here. 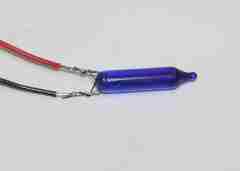 The reason for using the sensitive mixes is to get the fire started from a relative small piece of nichrome wire. If you use larger nichrome (and typically more voltage), CD ignition, resistor match, Christmas bulb match, or similar then BP meal with +10 metal like MgAl, silicon, or aluminum mixed with NC lacquer is just fine. Keep it well mixed so the metals are in suspension in the slurry. In addition, bind the item to be ignited tightly to the match head. Using BP based pyrogens have an added benefit, it is difficult to cause a BP based pyrogen to accidentally ignite through friction or impact. To use, dip the electrical match into the pyrogen being sure to make a nice thick coating, dry and then dip in NC lacquer to water-proof it. You can use table-tennis (ping pong) balls dissolved in acetone as an NC substitute. Use ruby solder flux. The finer the nichrome the better - 52 gauge is best but harder to work with. Wrap 36-52 gauge nichrome wire around the end of some 22 gauge solid hookup wire and solder it. Take a second piece of hookup wire and strip the end. Put it just in front of the end of the first piece of wire and continue to wrap the nichrome around both pieces. 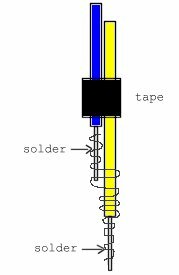 Solder the nichrome onto the second piece of wire. Nichrome doesn't take solder easily so keep it clean and use lots of flux (ruby flux seems to get the best reviews). After soldering, dip the fuse into some sort of igniting mixture and let dry. The one below was dipped into a thick ping pong ball, acetone, and meal powder mixture (see compositions.html). Keep the number of wraps between the first wire and the second pretty small. Fire with a 12 volt battery. If you keep the wraps to one turn or so between the wires, an Estes launcher will work. I haven't tried it, but everyone says a strand of fine steel wool works good if you don't have nichrome. Ideally, these should use a sensitive pyrogen but I sometimes get by with a BP mix. The above coating is quite thin so whatever it is igniting should be sensitive enough to take fire from the relatively small spark that will occur. 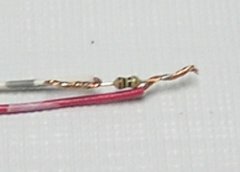 Another method which is a very clean one is to tie a 2.4 to 10 ohm 1/8 watt resistor between the leads. 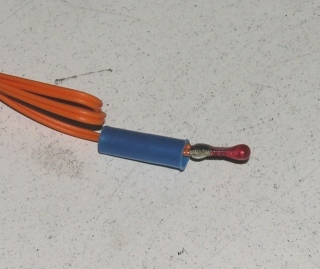 Hand wrap some stranded wire (I used some RS-232 cable that I had destroyed) around the resistor leads and trim to 3/8", tape, dip in a nice pyrogen, and dry. 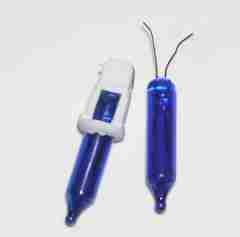 It takes 12-24 volts to pop these but they do pop well and, in many cases, probably wouldn't need the pyrogen dip - although for reliability you should dip them. 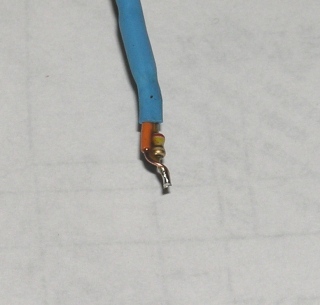 If using a BP pyrogen, make the coating nice and thick so there is a nice flare up when the resistor pops. The resistors are about $3.00 a hundred, much cheaper than that in bulk from Mouser or another supplier. They are dead easy to hook up. No soldering required unless you are going to store them for a long time - in which case I would wet them with solder just a tad (before dipping, of course) to keep them strong. More permanent example before dipping in pyrogen. Click image to see this one evaporate! 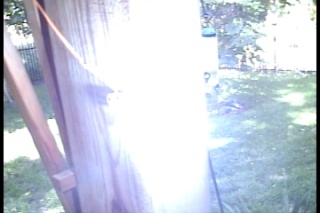 Click HERE for a movie of a 2.5 ohm resistor melting under a 36 volt Backyard Firing Box assault (see misc.html for a picture of that puppy). 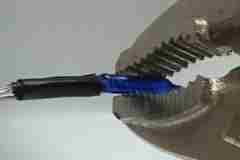 An alternative to using a hefty 12-24 volt battery to fire these is to use a CD discharge firing system. You can make one with a flash unit - just take off one terminal from the flash bulb and tie the match in series with it. However, converted flash units are quite rudimentary and somewhat dangerous. ODA enterprises, Pyromate, and others make very nice CD discharge units in single fire and up to 10 or 12 fire versions. Click on the picture below (same as one just above) to see a video of a 2.4 ohm resistor evaporating. One of the problems of the CD ignition system is that the electrical match destroys itself so fast that sometimes the composition doesn't get enough flame to ignite. A good thick coating of pyrogen and secure binding to the target composition is the solution in those cases. Standard BP pyrogen will work. And finally - the old Christmas bulb ploy. These are very easy to do and also quite cheap. 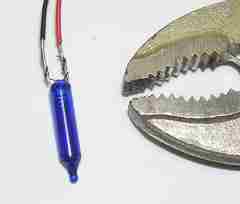 The trick is to solder the leads before you break the bulb. That way the filament is less likely to break. Also, be sure to insulate the leads before you break the bulb (a short piece of black tape does that). Some say that wrapping the bulb itself with tape before breaking it make things much neater. Some bulbs will fire on 1.5 volts so these make sensitive electric matches. Do a continuity check on them before you dip them to be sure they are intact. Click on the image to see the e-match we made work. This was fired with an Estes launch controller.